Does CononMark's new 3G Wireless studio lighting system demonstrate that Chinese manufacturers are finally starting to "show a little respect for their long-term customer"? Until a Chinese remote manufacturer shows a little respect for their long-term customer with generation-to-generation backwards compatibility, I would never consider (much less recommend) one of their remotes. It’s just silly. On the other hand, there are a few advances made here and there. 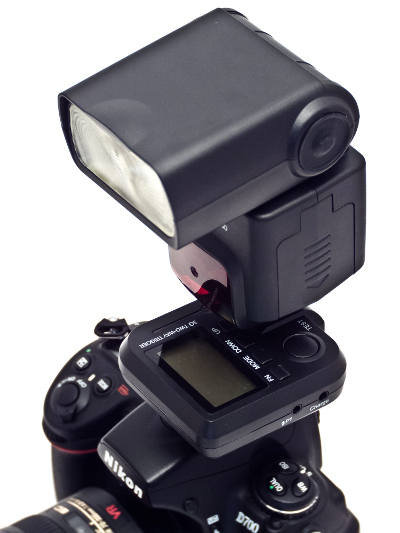 Phottix’s Odin works with the Strato II which, in turn, works with the older Strato. You can trigger a Pixel Opas with a King. But having a few pairs of different working triggers is no substitute for PocketWizard’s twenty plus years of continuous support. Indeed, it is perhaps ironic that the new PocketWizard Plus III‘s tagline is “The New Standard” when one of the brand’s unique selling points is that their standard is consistent and industry-recognised. They appeal to new users by introducing the old standard to extra sections of the market – such as with the FlexTT5 for speedlight users, PowerST4 for Elinchrom and “Integrated Solutions” for studio photographers. So then, all you need is a quarter of a century to build up a family of products reaching across the market, and you’re well on the way to approval in the US market. Nowadays, technology companies, particularly those in Asia, have a knack for getting things going improbably quickly. As a case study, consider Meizu, the mobile manufacturer. Less than ten years old, the company doesn’t have as long a history as Apple (est. 1976) but has nonetheless attained a similar cult following. What’s this got to do with triggers? Well, CononMark (aka Gaoneng), based in Shenzhen, have had a crack at creating an entire photographic lighting solution from scratch. It’s called the 3G Wireless System and comprises a range of studio lights all remotely controlled from a common 3G Wireless Remote. 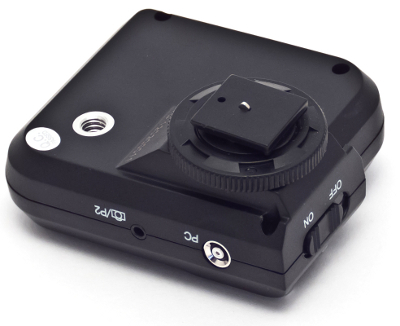 G4.0 – battery-powered IGBT location flash – the successor to the Photoflex TritonFlash, Phottix PPL, etc. So then, we have lights for the studio, lights for location, lights powered from a car battery and lights with IGBT circuitry for action-stopping flash durations. 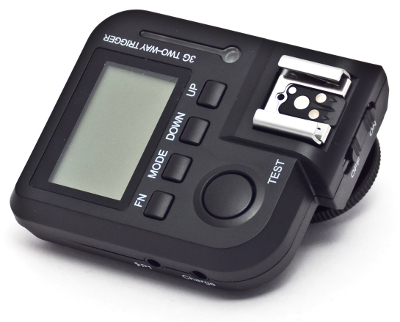 In appearance the love-child of a PocketWizard Plus III and a Flex TT5, the CononMark 3G Two-Way Trigger is a manual transceiver remote with a full LCD screen. It can set off hotshoe flashes and studio lights (even both at the same time) and remote cameras from up to 100 metres away. If only CononMark had spent as much time choosing a name for this trigger as they clearly have designing it. From here on, I will refer to it as the “Multi-Functional Two-Way Flip-Flop” because that’s what Google Translate calls it, and I think that’s just ace. 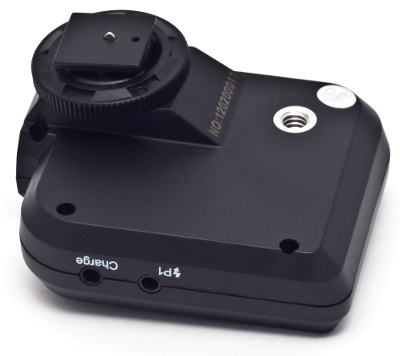 The 3G Flip-Flop has output ports for remote cameras and flashes in the form of both 2.5mm and PC jacks. Something to please everyone. There are 16 channels just for use with other Flip-Flops, as well as channels F1-F5 which correspond to the built-in radio receivers on the CononMk flashes listed above (the Flip-Flop can also act as receiver to the 3G Wireless Remote). 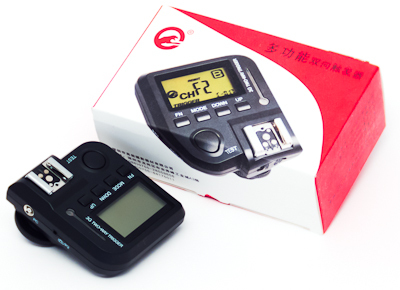 In a certain mode you can even use these transceivers with the 2.4GHz Wireless Controller from the same company. Hang on, where’s the battery door? Well, there isn’t one. 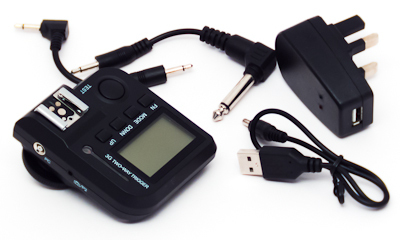 All of CononMk’s current triggers use integrated lithium ion batteries and charge from USB. What?! Non-removable batteries?! I’ll send them an e-mail in bold red letters on my MacBook Air giving my thoughts on this. Better yet, call them on my iPhone and complain directly. Non-removable batteries indeed! Then I remembered how much of a bane changing, charging and replacing AAs and AAA batteries is. I changed my mind. There is a battery level indicator on the Flip-Flop LCD, and even a shot counter that lets you know how many pictures you’ve taken. 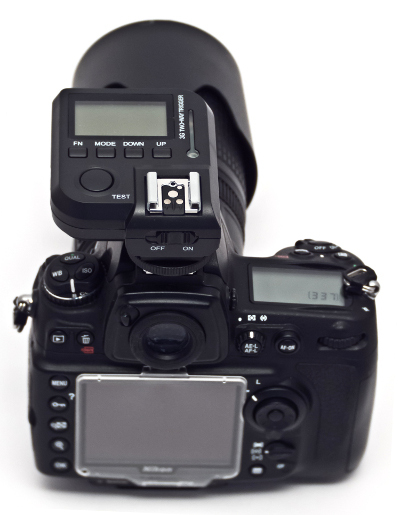 Unlike some other Chinese triggers out there, the CononMk Two-Way Trigger looks slick and professional on your DSLR. The display is just as easy to read as your camera’s own top LCD. You can even mount another flash or trigger on top of it. 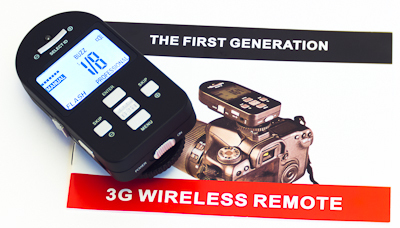 The 3G Wireless Remote, Two-Way Trigger (Flip-Flop) and GE-400 LCD control panels are all devilishly simple – CononMark have built up a good reputation (with me, anyway) for making clear, crisp, easy-to-use interfaces. Your instruction manual could remain in mint condition since you may need never delve into its pages. Throughout the entirety of my CononMk DD400S review the LCD was broken but I still had no trouble using it. 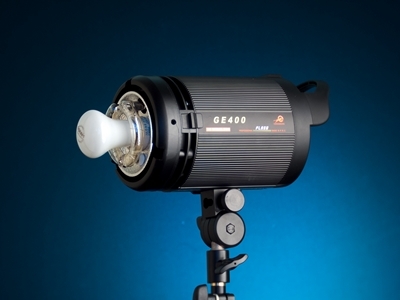 The manufacturer sent us some GE400 monolights to try out. The kit includes two flash heads with protective caps, a 3G Wireless Remote, cables and modelling lamp bulbs. No reflectors are included. The GE400 body is built like a tank. It’s an all metal design that feels like it could withstand anything you could throw at it. That said, it doesn’t weigh a ton so would be useful for location photography. The light stand bracket isn’t the best I’ve seen but it isn’t too shabby either. The Bowens bayonet has a strong, stiff release catch that gives me confidence this light will hold modifiers securely. The rear LCD is almost identical to that on the 3G Remote – big, crisp, clear and backlit. If you don’t want to use the CononMark proprietary triggering system then there is a 6.35mm sync port and a caddy on top of the head to hold any radio receiver with a coldshoe foot. 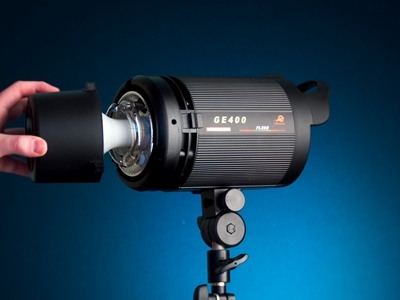 You can power the GE400 down to 1/64 of full power in full stops. Unfortunately there are no partial stops. Everything you can control from the monolight itself can also be controlled from the wireless remote. That includes ready beep on/off, modelling lamp and optical slave cell. Wireless flashes are split into two Groups, A & B, and within that IDs for each light. Selecting “All” on the Remote will trigger every ID in that Group while picking “Each” will only trigger the selected ID. The included modelling lamps are 60 Watts and have no proportional control – on and off and that’s your lot. One quirk is that the included protective caps don’t fit when the modelling lamps are installed. Of course you can buy longer Bowens-fit protective caps separately. 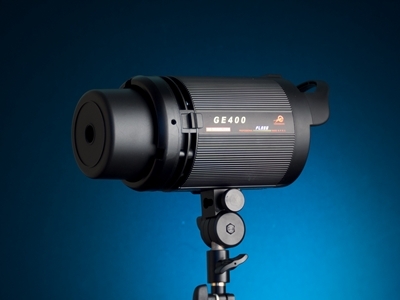 There may be a method to their madness – if the GE400 is designed as a location flash then you may prefer to keep the head as compact as possible when travelling. When powering from an inverter such as Tronix Explorer then you would use the lamps sparingly anyway. Or maybe they just didn’t think this one through. 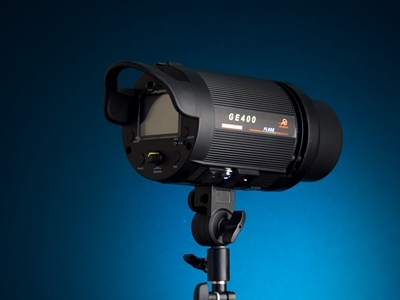 Overall the GE400 isn’t a high end monolight by any means but it does have nearly everything you need. With remote controllability and compatibility with the “Flip-Flop” transceivers and other 3G lamps, you are buying into a system. For a casual photographer or someone on a budget, perhaps hoping to expand later, it could be just what you’re looking for. At the time of writing we don’t have access to other lamps in the range to evaluate. It’s not yet known exactly which retailers will be stocking the CononMark 3G System, when, or for what price. However, you can view video demonstrations of all the 3G products being distributed in the UK by Strobeam on their YouTube channel. The CononMark GID50, G4.0 and GE400 are already available on eBay. Could a system like this become widely adopted? Would you buy into it? Is there anything we should cover in more detail? Let us know your thoughts below.